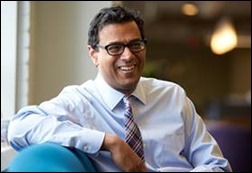 I was excited to hear that Atul Gawande, MD has been booked as the opening keynote speaker for HIMSS19. Many of us were initially enthusiastic about the efforts by Amazon, Berkshire Hathaway, and JP Morgan Chase to revolutionize healthcare delivery. That enthusiasm was somewhat tempered by the clarification that they’re really focused on solving the issue for themselves as employers, although it may eventually be extrapolated to the world at large. Regardless, Dr. Gawande has significant street cred in the healthcare trenches, and as a practicing physician, I’d much rather hear from him than from some of the other recent HIMSS headliners. I was also excited to hear some information coming out of the American Academy of Family Physicians annual meeting this week. The American Board of Family Medicine used the meeting to announce a pilot program starting in January that will “assess the value and feasibility of a longitudinal assessment option to the 10-year secure examination.” Completing educational opportunities on an ongoing basis rather than cramming for an exam every 10 years is much closer to what we do every day in practice and was the preferred choice for recent exam-takers who were surveyed by the University of Florida in conjunction with ABFM’s assessment of the role of the exam. The questions will be administered quarterly and providers can use resources to find the answers, which better demonstrates our ability to manage knowledge rather than memorize. I’m doubly excited since I have to recertify in 2019, although I already spent nearly $1,000 on a self-study board review course. The proposal still has to be approved by the American Board of Medical Specialties Committee on Continuing Certification in November. There aren’t any details on how large the pilot will be or whether everyone who wants to participate can actually take part, so I might still have to take the exam. I’ll be crossing my fingers, though. The use of ride-sharing services as an alternative to ambulances for transportation to the hospital is getting some coverage in mainstream media. Data from 2011 shows that the US spent $14 billion on ambulance services, more than a third of which was paid for by Medicare. Inappropriate use is estimated at approximately 30 percent. Although it sounds like a good idea from a cost perspective, I’ve found that in practice, patients don’t do the best job of determining whether an ambulance is necessary or not. We’ve had patients in the midst of active heart attacks at our urgent care who want to argue with us about an ambulance transport because of the cost. I’d hate to see someone in that situation summoning an Uber to their home because they’re worried about the money. In order for this lower-cost transportation to be appropriate, patients are going to need education on whether it’s the right option for them. Maybe the ride sharing services need to add some screening questions to the app to not only help patients, but also to protect drivers from unwittingly picking someone up who needs serious medical attention. So far, what I have heard about Uber Health is that it will allow providers to order transportation, but doesn’t necessarily address the issue of patients trying to get rides on their own. I’m still up for some screening questions in the apps themselves. Last week, the US Senate sent for presidential signature a bipartisan package fighting the opioid epidemic. The bill passed the Senate by a vote of 98 to 1, showing that political adversaries can and actually will cooperate when the circumstances are right. The only opposition was from Senator Mike Lee of Utah. The 600-plus page bill includes relaxation on Medicaid payments for inpatient treatment, increased surveillance on opioids being imported by mail, and allows certain midlevel providers to prescribe buprenorphine treatment. It doesn’t appear to have been signed yet, but I’m keeping my eye out. The opioid bill is timed nicely with the release of the Surgeon General’s report on “Facing Addiction in America.” Assisting in management of opioid use (not only prescription, but illicit versions) is an area where EHR technology can be expanded for better support of clinicians. It’s not just about making it easy to link the EHR to the state prescription drug monitoring program (assuming the state has one, which one state does not) but in getting those links into the right part in the prescribing workflows and making the connections fast enough that they don’t impede provider workflow. It’s also about providing clinical decision support including morphine equivalents for drugs patients are already taking as well as those providers are considering for a new prescription. These should be relatively simple things to code, but don’t seem to be given much bandwidth on the development calendars of vendors. It’s National Health IT Week, but I didn’t see a celebration in the physician lounge. Most of my local physician colleagues still see healthcare IT as a threat, not necessarily because of what it offers at face value, but because it’s a proxy for the perceived decline of medical practice as they used to know it. National Coordinator for Health Information Technology Don Rucker, MD blogged on the HIMSS site about how automation in healthcare is transforming medicine. Rucker talks a fair amount about the 21st Century Cures Act and its prohibition on information blocking. Despite being signed into law in December 2016, it hasn’t done anything to improve information blocking in my region, which is largely due to competing health systems that refuse to share data even though they could do it fairly easily if they wanted to, especially now that all of them are on the same vendor platform. As an urgent care physician, I can’t even get their physician-owned practices to give me a medication list over the phone (despite the fact that it’s permissible under HIPAA for treatment, payment, and operations), let alone gain access to their clinical data repositories to find out what testing has already been done for patients before they arrive in my exam room. Speaking of automation (or lack thereof), I’m still battling a billing issue with the hospital where I had emergency surgery over a year and a half ago. They sent me a bill last month for which I had no explanation of benefits document, which is unusual since I save every scrap of documentation around my healthcare. I hadn’t yet had time to call my insurance and see what the story was, but in the mean time, the hospital sent me to collections less than 30 days from the date of the statement. I hopped on the phone to the payer, who had no record of a claim for that date of service, then had to call back to the hospital’s outsourced collections company, which provided me a supposed claim number. I called back to the payer to learn that the provided claim number didn’t even fit the standard format. They dug a bit deeper and found a charge for the same amount, but on a different date of service. It turns out it was paid, no one knows why I didn’t receive an explanation of benefits, and no one can explain why I was billed more than 18 months after the fact or why I was sent to collections less than 30 days after the bill was mailed. I paid my co-insurance online after sorting it all out, so hopefully this adventure is at an end. What’s the longest running medical bill saga you’ve ever seen or experienced? 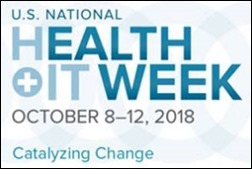 What are you doing to celebrate National Health IT Week? Leave a comment or email me. It turns out that many states have information blocking (!) from their PDMPs. In fact, many state laws prohibit PDMP data from being exported outside the system to EHRs (it can only be seen in view-only mode on their web browser interface), making use in clinical decision support problematic. It’s not an issue of EHR vendor unwillingness, but rather that they can’t do an implementation if they can’t consistently get the data. I manage my mother’s care and after receiving bills fir services from different care providers did some research on billing “limitations”. For the state we live in, clinical services can be billed up to SIX years after the service is provided. There is no counter option for the patient to pay in six years. If the technology has been designed primarily for financial advantage, as often stated, it’s been poorly done.